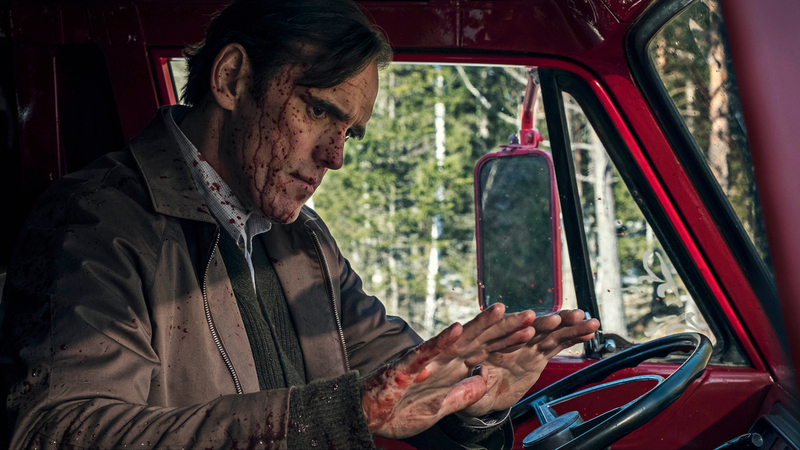 Persona non grata and middle-aged man terrible Lars von Trier returns to UK cinema screens with serial killer black comedy The House That Jack Built, as slick as viscera and as vile as the subject it portrays. There’s a scene near the start of The House That Jack Built which pretty much sums up the film. An uppity woman – Uma Thurman – flags down Jack (Matt Dillon) to give her a lift. Her car has a flat and her jack is broken. Would he help? Of course, the woman is so worldly as to know not to get into a vehicle with a stranger and immediately starts joking about him being a serial killer. The scene is interminable, an extended gag basically, because he is a serial killer. Ha ha. And he will bash her stupid blabbing face in with a ‘jack’. Geddit? Like his name? And who can blame him? She was literally asking for it, right? This is the first incident of five which will serve as chapters through which Jack – in dialogue with the unseen Verge (the Yoda-ish Euro tones of Bruno Ganz) – will tell his tale, explain his motivation and chronicle his career of murder. Like John Doe in Se7en, Jack considers himself an artist – enter some clips of Glenn Gould – though frustrated by the fact he is an engineer who longs to be an architect. His murders are compositions and, although initially hampered by acute OCD (which then disappears for no real reason), Jack proves a knack for killing. We only get to see his selected works, as he claims to have killed over 60 victims later in the film, and the corpses pile up in a walk-in freezer on Prospect Street. Jack admits to his psychopathy, displaying a series of cards with attributes like Bob Dylan in the video to Subterranean Homesick Blues. We see his attempts to pass for normal, his strategies and techniques, his artistry. Just as grapes must decompose to produce wine, so his victims – overwhelmingly women – must die to produce the photographs he sends to the local press. Or maybe he is an addict, soothing his own pain. The film and Jack are fascinated by themselves; the victims are just material for more gags. Much like the woman’s body that gets dragged behind his van leaving a long red brush stroke. Oh, stop Lars. Stop. Of course, the great Dane is a compulsive provocateur and this Portrait of the Artist as a Serial Killer is predictably shocking. As well as the violence and mutilation perpetrated on women and children with ironic detachment, Jack also recites an observation about the beauty of the Stuka dive bomber which von Trier himself made in interviews prior to the infamous “I’m a Nazi” Cannes press conference. We get clips of von Trier movies to show how suffering and mutilation have been used to make ‘art’. And in a search for fresh fields on which to cause outrage and consternation, Jack talks up how “men are born guilty” and how unjust that is. Like Jordan Peterson with a murder van. With no apparent sexual urges, Jack is the incel Übermensch. #MeToo that, assholes. Despite Verge’s weary irony, it is Jack’s view that prevails. And von Trier loads the deck. All von Trier films exist in his own fictional universe, somewhere between the USA and Denmark; mythology and pulp. When victims call for help, it’s difficult to know whether no help comes because of the horrific indifference of the world, or because of the horrific indifference of von Trier’s world. Even Verge’s countervoice is really an acting of dishonest ventriloquism on the part of the director.